I found an amazing fare on Norwegian for October/November: U.S.$461 Boston–>Oslo–>Paris (Orly) and back Paris (CDG)–>New York (JFK). For the same dates, it would have been U.S.$480 round trip New York (JFK)<–>Paris (CDG). The advantage (or disadvantage, depending on your perspective) to my ticket is that I had a 7-1/2 hour layover in Oslo yesterday. I spent three weeks touring around Norway in 2011–the Vesterålen Islands, Lofoten Islands, fjord country and Bergen. See my trip itinerary here. But aside from an airport hotel, I hadn’t been to Oslo. So a day in the capital city sounded like a plus to me! Taking a day trip into the city could not have been easier. There is left luggage in the arrival hall if you don’t want to carry your bag all day. SAS runs a shuttle bus every 20 minutes from Platform 11 just outside the arrivals hall at the Oslo airport. You can buy your ticket right on the bus. It’s a comfortable 45-minute ride to Oslo Bussterminal (which my fluent Norwegian tells me is the Oslo Bus Terminal) in the center of town. Or you can get off at the last or second to last stop (Professor Aschehougs plass) right on Kristian IVs gate, one of the main shopping streets. While I didn’t have time to go in any of the museums, I did spend a couple hours just wandering around, getting a feeling for the city. 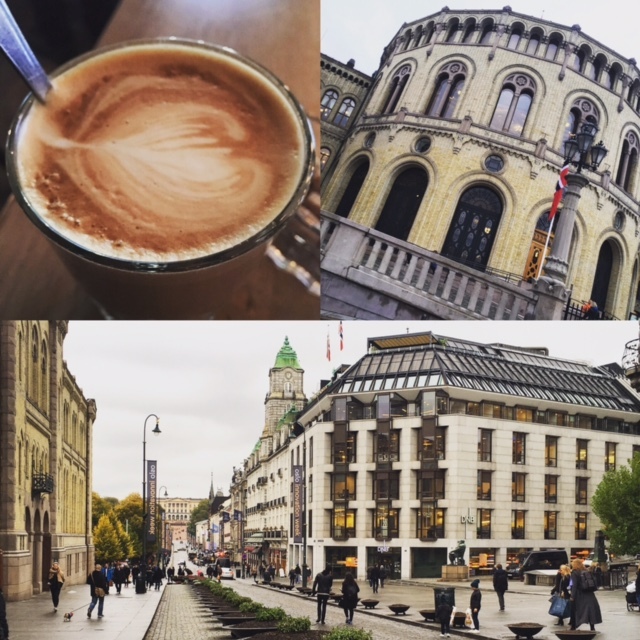 Despite the overcast skies and chilly temperatures, Oslo was a perfectly pleasant place to spend the afternoon. 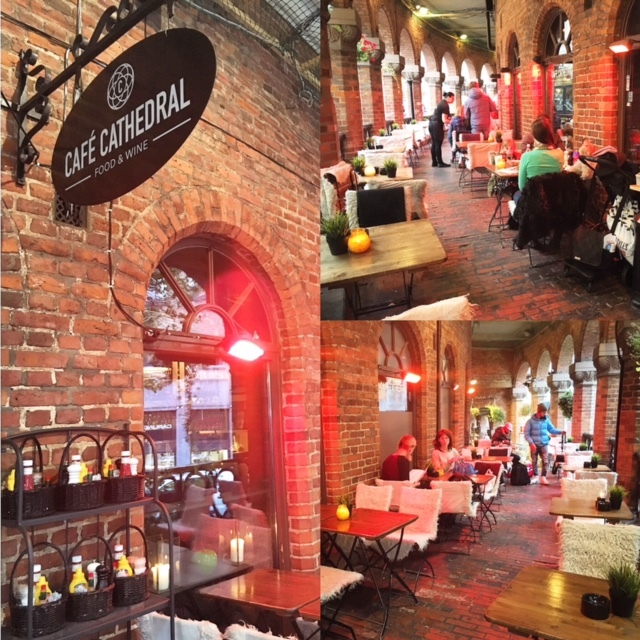 I had lunch at Café Cathedral, not surprisingly just next to the Cathedral, which has a cozy indoors and a lovely terrace warmed by heat lamps. The chicken skewers were delicious and the hot chocolate with whipped cream warmed me up nicely! Just 45 minutes on the bus and I was back at the airport, which is also a very pleasant place to spend some time (as far as airports go) or get some work done on the free and speedy wifi. For that price, I certainly wouldn’t hesitate to fly Norwegian Air again. It’s just 6h20 Boston to Oslo and under 2 hours from Oslo to Paris Orly. The plane (Boeing 737) was new, with large individual TV screens and a good selection of free movies. Apparently they also have some innovative cabin air pressure system where you don’t feel the altitude as much (as though you were at 1400m and not 2400m) and it’s more comfortable for international flights. They also have blue lights in the cabin to make it easier to sleep.